We truly understand the significance of mobility freedom. We embrace our mission, our purpose to serve our customers, bring smiles to their faces and, most importantly, give them back their independence. Some will say that getting to the top is relatively easy. However, staying at the top — now, that is a challenge. Since the beginning, our company, Top Mobility, has set a goal. It’s a goal literally embedded in our name, in our identity — to be the top of the mobility industry, in all aspects. Being in the mobility industry for nearly a decade has been a true privilege for us. We are very fortunate to say we are actually changing lives, one customer at a time. Our expert, manufacturer-trained mobility specialists are always here to take your call and answer all your questions through education, product selection, and services with professionalism, compassion, and dependability. Every customer is our top priority. Our website is secure for a safe shopping experience. We are also committed to keeping the information on our site accurate, informative and constantly up to date. 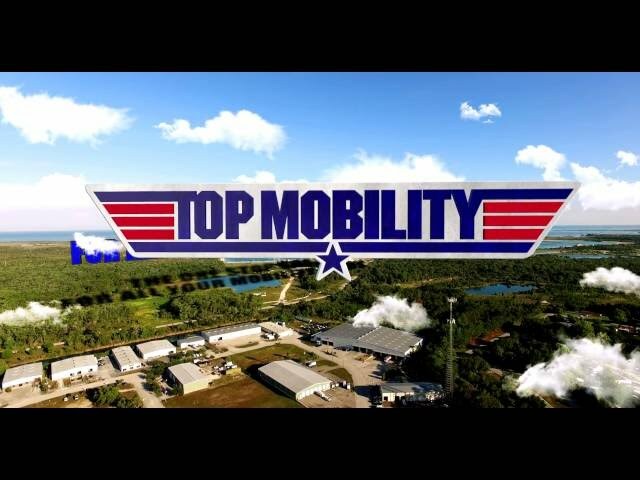 Top Mobility Scooters, Inc. has partnered with leading mobility companies recognized for innovation, design, service, and quality. We offer a large selection of mobility enhancing products such as scooters and powerchairs, wheelchairs and walking aids, lifts for vehicles to carry your mobility equipment and transfer solutions, ramps and accessories to make your home accessible, lift chairs to help you get up or just to sit and relax comfortably and much more. We only carry the most trusted brands in the industry: Challenger Mobility, Pride Mobility, Golden Technologies, Mego, Bruno, E-Wheels, Freerider, Solax, Tzora, Harmar Mobility, EZ-Access and Shoprider Mobility. We are a factory-authorized dealer of all products offered in our local or online stores. All our products come with a full manufacturer warranty on parts and, on most brands, we offer an extended in-home-labor warranty at no additional charge. Every one of our employees is dedicated to helping you find just what you’re looking for from our more than 1,500-item catalog. Given the wide selection Top Mobility offers, we’re confident we can find you the mobility or recreational scooter or product that best suits your personality, your lifestyle and, of course, your budget. At Top Mobility, we’re like family. We’ll ALWAYS be there for you. All our sales associates and staff work tirelessly to find our customers the best solution for their mobility needs. Our sales associates are KNOWLEDGEABLE. Our service department is FACTORY TRAINED. Our customer service is COMMITTED. If you’ve got a problem with your scooter or mobility product, we’ll find a solution. We’ll take the time for you, our customers, so you can get back to enjoying your freedom and independence again. That’s why at Top Mobility, we’re at the TOP of mobility. On over 1,500 Top Sellers! We ship from over 50 warehouses, getting your product to you in 1-5 Days.